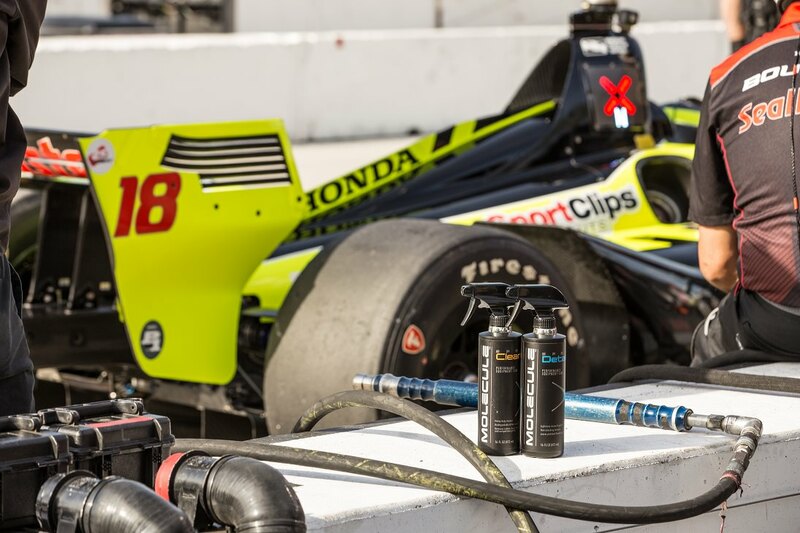 San Clemente, CA – Molecule is excited to officially supply Dale Coyne Racing team and drivers for their assault on the IndyCar series and the 102nd running of the famed Indy 500. Molecule partners with Dale Coyne and kicked off at the Toyota Grand Prix of Long Beach, Molecule will continue to supply DCR with products for all of their cleaning needs. “We’ve been delivering product to DCR for the past few years. We have a ton of respect for Mr. Coyne, Jimmy Vasser, Sulli and the entire team, so it was a natural to try to figure out a way to formally support them” explained Molecule’s Frank Bain. Dale Coyne Racing has a rich history in open-wheel racing and is a great addition to the Molecule family of teams and athletes. With the official supplier program, the Molecule brand looks to solidify its position in the open-wheel market with its renowned performance apparel care, helmet care line and competition vehicle care. Catch the Molecule crew hanging with the DCR team at IndyCar races around the country.